History buffs will appreciate Rhodes Town, which holds treasures from Ancient Greece, and remnants of Byzantine occupation. Its Venetian-styled Byzantine mosque, the Mosque of Suleiman, and its Turkish baths, reveal traces of the latter. Visitors enjoy the new town's bars, nightclubs and tavernas, though. The long stretch of beach is popular during the day. Apart from its many historical wonders, Rhodes Old Town offers some exciting shopping. Indeed, the area's charming old streets complement the traditional wares on offer in shops and stalls. Among other things, visitors will find traditional jewellery and pottery. Rhodes Old Town also provides a range of antique goods and modern souvenirs. Otherwise, Visitors can buy foodstuffs such as good Greek wine and traditional Greek olive oil. Rhodes New Town has plenty of high-end and designer shops. Rhodes has everything from the quaintest traditional eateries to Starbucks. Essentially, visitors can indulge in fine dining or keep things budget-friendly. As one of the most popular islands in Greece, Rhodes provides a varied nightlife. Visitors will find bars, dance clubs and bouzouki clubs, particularly in Rhodes New Town. Faliraki resort also has a famous party scene and is very close to Rhodes Town. The atmospheric Old Town has many great restaurants, and venues offering traditional entertainment. 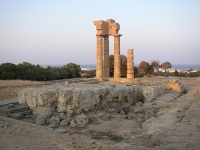 Rhodes Town has many historical attractions. The Street of the Knights is particularly intriguing. It followed the course of an even older track that once led from Rhodes' Acropolis to the harbour: where the legendary Colossus stood. Today, the area features buildings that were constructed for the Order of St John's knights in the 16th century. Each one served as a different national group's inn. The town's Byzantine remains are also fascinating. Otherwise, visitors can retreat to one of the lovely beaches nearby. Surfing and scuba diving are popular watersports. Rhodes Town gets crowded during summer. It's also infamously labyrinthine, meaning navigation can be a little confusing.